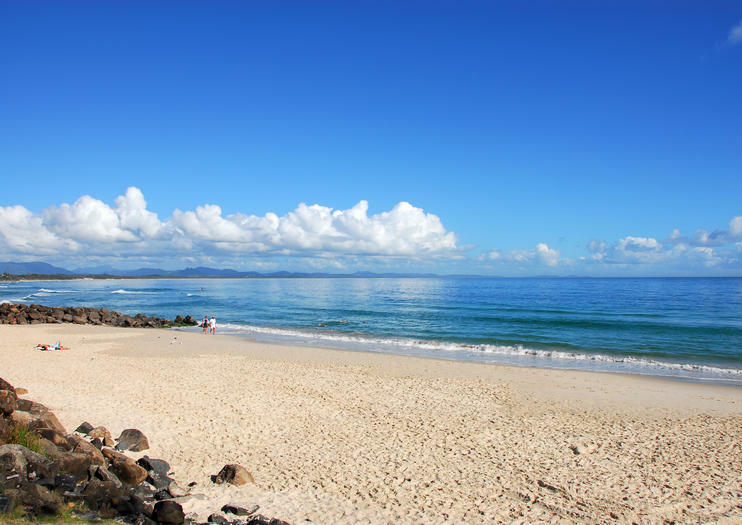 Suitably named, Byron Bay's Main Beach stretches along the front of the town and is the go-to destination for beach lounging, swimming or catching a wave. On a sunny day in Byron Bay, expect locals and visitors alike to be making the most at Main Beach – the town's closest beach outlet. Main Beach is known for its beautiful surroundings, with views of the Julian Rocks, Cape Byron Light and grassy hills meeting the horizon line of white sandy beach and enticing water. Besides swimming and beach lounging, a popular activity is to snorkel out to the old shipwreck of the Tassie II just off-shore. The reliable right and left-hand breaks at Main Beach make it a popular place for beginners to learn to surf. Several surf schools operate directly at Main Beach, but make sure to research this fact before making a booking. Surf schools must be authorized to operate at the beaches of Byron Bay or else they travel several minutes outside of the region for their lessons. The Surf Club has called Main Beach home since 1906, and you can expect a patrolled beach during the summer month, but always remember to swim between the flags.